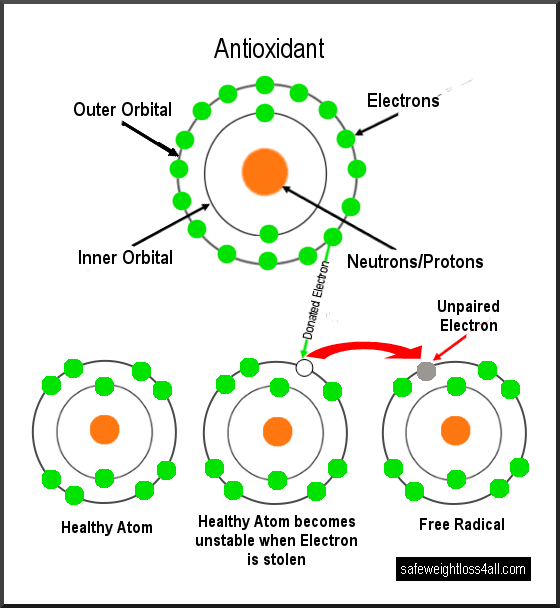 Free radicals, which I will often refer to as radicals, are molecules that are uncharged, becoming unstable and highly reactive due to an unpaired electron. Although there are number of different types of free radicals, there are three that are particularly destructive: Superoxide Radical, Hydroxyl Radical, and Lipid Peroxyl Radical. There is also Singlet Oxygen, not a true radical by name, but equally as destructive. These radicals each target different types of cells, once in contact they wreak havoc and cause so much damage that the cell is unable to function properly and will eventually die. These highly reactive and unstable radicals, once formed, go on the rampage, looking for healthy cells to steal electrons from, setting off a chain reaction. Quite often, two radicals can bump into one another, stealing from each other, thus creating healthy atoms and eliminating radicals. There are trillions of different type of cells in our bodies, too many to mention here, that can be damaged by rampaging radicals. For example, if a radical comes into contact with a cell membrane it can severely damage it through a process called lipid peroxidation, which can lead to the cell eventually dying. DNA damaged by radicals can increase the risk of developing a number of life-threatening diseases such as cancer. They are also responsible for speeding up the aging process. It’s frightening to think that if just one free radical can destroy an entire cell, what would happen to our bodies if these radicals went completely out of control. The illustration I have created below may help you better understand the vitally important role antioxidants play in keeping these radicals under control and keeping us healthy. As well as naturally occurring in our bodies, there are also external sources responsible for the production of these radicals, smoking being a major one. Free Radicals, if they’re so dangerous Do We Need Them? Yes, we do, provided a balance is kept between free radicals and antioxidants. Superfoods: Antioxidants. The liver, while producing free radicals, also uses them in the detoxification process. White blood cells, which are mainly responsible for maintaining a healthy immune system, send free radicals to destroy harmful bacteria and viruses. They also help in eliminating our bodily waste and toxins. If this balance is not maintained and the body is unable to control these radicals, a condition known as oxidative stress occurs, allowing these radicals to freely alter DNA, protein and lipids. If the levels of oxidative stress become too high it can affect everything in our body: organs, tissues, metabolism, and the immune system. Allowing oxidative stress to continue unabated, it can lead to many life-threatening diseases: cancer, cardio-vascular disease (CVD), stroke, obesity, diabetes, to name a few. It has also been linked to the onset of dementia. Apart from these life-threatening diseases, people with high levels of oxidative stress may also suffer many other symptoms including: inflammation of the joints, depression, anxiety, muscle weakness, a constant feeling of tiredness and fatigue. No, we can’t, it is a natural process that exists all around us. It is oxidation that causes ferrous metal to go rusty, and fruit to get brown patches. This same process also happens to our bodies, both externally and internally. External oxidation is responsible for aging and wrinkles. High oxidative stress will speed up this process, leading to premature aging. Internally, oxidation occurs during the metabolic process when the food and drink we consume and oxygen from the air combine and is turned into energy. A similar process that rusts ferrous metal now “rusts” our organs and body tissues. Quite simple really! Unless there is an underlying health problem causing malabsorption of certain vitamins and minerals, make sure your antioxidants outnumber free radicals by practising a healthy lifestyle and diet containing plenty of fruit and vegetables. One of the major causes of oxidative stress is low antioxidant levels due to unhealthy lifestyle and poor diet consisting mainly of fast and processed foods. Deep frying at high temperatures of foods such as French fries, chicken nuggets, etc, will destroy most of the nutrients they contain. Fast foods high in fat and cholesterol, like burgers and many processed foods, are deficient in many of the nutrients we need to stay healthy. Processed, or granulated, sugar is a major cause of oxidation, the more we consume the higher the oxidation as the body processes the sugar. It is also known as an “empty calorie” food, meaning it contains no nutrients whatsoever. Commercially prepared baked goods such as cookies, pastries, many types of bread, snack foods, and many processed foods, are also high on the list of unhealthy foods. Most of these foods are prepared with some of the most unhealthy ingredients imaginable: white flour; processed vegetable oils and margarine, which are trans fats, the worst kind; sugar; artificial sweeteners, many of which are highly acidic. how can i determine my free radicals/Antioxidant ratio? In many cases, a general feeling of wellness will indicate enough antioxidants are being produced to win the battle with radicals. By the same token, there are numerous unpleasant symptoms that may indicate free radical damage: feeling constantly depressed; suffering from anxiety and mood swings, irritability, tiredness and fatigue; painful joints. If you are suffering from one, or any, of these symptoms, a simple urine test will indicate the free radical/antioxidant ratio and the amount of oxidative stress. Each cell has a layer of fat, when this layer of fat is attacked by a radical a process called lipid (fat) peroxidation takes place. This oxidation produces a chemical by-product known as malondialdehyde(MDA). The level of MDA is ascertained by adding a reagent to a urine specimen, which will change color, giving an indication of the level of oxidative stress, the darker the color, the higher the oxidative stress. DIY kits are available online or at pharmacies and many health stores, but I would suggest asking your medical practitioner or suitably qualified health professional to carry out the test for you. They will be able to assess more accurately the level of oxidative stress and advise you on the best course of action to correct the imbalance of antioxidants/free radicals, and, in all probability, monitor your progress until the imbalance has been reversed. If you decide to do the test yourself and the urine specimen becomes dark, seek professional help. 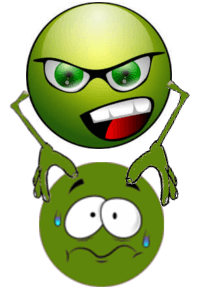 As the level of oxidative stress increases, so the level of health decreases. That’s about it on free radicals, I hope you found the information helpful. All the content in this article on free radicals is for information only and not intended to recommend or offer advice. Before taking supplements or starting on any diet and/or exercise program, weight loss or otherwise, it is always advisable to seek appropriate professional advice.